On a remote jungle island, genetic engineers have created a dinosaur game park. An astonishing technique for recovering and cloning dinosaur DNA has been discovered. Now one of mankind's most thrilling fantasies has come true and the first dinosaurs that the Earth has seen in the time of man emerge. But, as always, there is a dark side to the fantasy and after a catastrophe destroys the park's defence systems, the scientists and tourists are left fighting for survival. Jurassic Park is one of my favourite films, but I've never taken the time to pick up this novel. I often quote the film as something that can't be topped, a work of sheer mastery that could never be rivalled. I am also well known for my "book is always better" mantra when faced with a book-to-film adaptation. Today, I hold my hands up and admit myself to be wrong, because this is one of the very rare books where the film is better. Don't get me wrong, there were great parts of this novel which I loved, and which should absolutely have been part of the film. There were excellent academic explanations of how the park was possible, explanations which evolved my understanding of dinosaurs, and science in general. Most of these, however, were completely unnecessary and verbose, completely taking away from the suspense and thrill created in the previous pages. Every character in the novel is there to serve an almost stereotypical purpose. We have the 'omg dinosaurs' palaeontologists, the crazy and stubborn old man, the great white hunter, the kids in danger, the cynical brainbox, and the traitor. None of these characters are developed into heroes, and none of them are given an adequate back-story to allow us to get on their side. 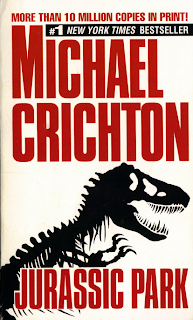 What Crichton does do, however, is place them strategically around the plot to either cause some tension, move the plot along, or make a point. They are horribly flat and boring, however, and I didn't feel much for any of them. I really enjoyed Crichton's message here, though. John Hammond creates this park simply to make money. He doesn't want to invest in helping people through medicine, such as a cure for cancer, as this would have to be government-controlled and sold cheap. He wants to make as much money as possible by doing something no one as ever done before. Money, glory, and the most dangerous creatures you can imagine. Crichton shows us the problems involved in trying to control nature, trying to reach beyond your grasp, and underestimating the power of the unknown. This is worth a read for dinosaur/science fans, but it's definitely not a must-read.